Well, it's been a week and half since Sunapee fair ended, and I'm still exhausted. It takes a few weeks to really recover from the 9 day fair, which really translated into a full week and half when you count the set up dates, trying to fix things and get your booth together. This year was hard on me physically for the weather was really lousy - hot, humid days. Only 2 days were really nice while the rest of fair was long, hot and too much humidity. In fact, I ended up with 3 asthma attacks in one week due to the humidity/heat, when I normally get 2, maybe 3 a year. That shows just how hard the weather was on us League of NH Craftsmen members and staff. I just hope 2013 will be a little cooler and dryer. Another casualty was my booth walls. I use 2 pop up walls as my booth, for it is very professional, clean, sleek, goes up fast and showcases my work well. However, my walls didn't survive Sunapee - the wall panels came apart and the frames have a permanent list to one side. I ended up ordering 2 new walls for future fairs. Every day during the fair, I would walk into Tent 4 and pray my booth was still standing. Several times, the panels just peeled off and let's put it this way, a lot of duct tape was holding my booth together. Tearing down booth at end of fair entailed a lot of peeling off the darn tape. Despite all that, Sunapee turned out to be my 3rd best fair overall, so that was a relief. 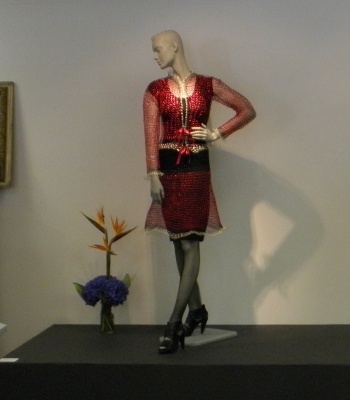 My Red Bolero jacket and skirt won Public Choice Award in CraftWear. I cannot tell you how many people, especially men just loved my red jacket and skirt. Almost as many people loved my candlebras, so I can see I'll be busy making lots of candleholders in the future. I ended up delivering one to a customer down the road from me, so talk about personal delivery! Right after Sunapee ended, I had to do quite a few private lessons and my weekly classes, so I didn't get any downtime till almost a week after Sunapee. Went to see a friend and she took me out on her boat on Lake Monomonac in Rindge, NH. I finally get to fulfill an old dream - getting on one of those tiny islands that dot the NH lakes. I always wanted to get on those little islands and be in the middle of a lake, so I got to do that. Micky, my friend's dog was keeping me company. Doesn't matter if they are just rocks with a few trees, I just want to climb onto them. There's something very New Hampshire-ist about our little rocky islands on our NH lakes - all those scrubby pine trees, white birch trees and firs. There's a very unusual house called Saint Marie, which looks like a yault sticking out of a low cliff. The story behind the house is that it was built by a retired priest turned art collector long ago. It just fascinates me. Spike, the new hedgie is coming along slowly. He's not quite so defensive and I'm getting a purr time to time from him and he's very slowly relaxing. It just takes time and patience to get a hedgehog to relax and lay his/her quills down. However, he is like greased lighting - moves fast and does not slow down, long enough for me to get a decent picture. Spike learned to use a wheel to run so progress made. He is a very curious boy and likes to explore, so that's a healthy attitude he has. By next year, he'll cuddle down with me. Gump is still good, but I can tell he's getting old and not as well as he should be. Gump is so much tamer than he was when he first came in Feb 2011. Still loves to bite - man, that little guy has a serious anger issue. If I can find tiny pacifiers, I'll be getting them for Gump!